This article first appeared in The Edge Financial Daily, on May 25, 2016. KUALA LUMPUR: AirAsia X Bhd (AAX) reported profitability for a second straight quarter with a net profit of RM179.49 million for the first quarter ended March 31, 2016 (1QFY16) compared to a net loss of RM125.92 million a year ago. Revenue rose 25.2% to RM970.67 million from RM775.37 million in 1QFY15. Its net gearing was reduced to 1.2 times from 1.77 times as at Dec 31, 2015. In a statement, AAX said it posted an operating profit of RM105 million in 1QFY16. The low-cost carrier also booked a foreign exchange gain of RM122 million. The progress of its turnaround plan initiated in 2015 and strong return of business from China and Australia markets in 1QFY16 also contributed to the improved results. The long-haul low-cost affiliate of AirAsia Bhd saw a 15% year-on-year (y-o-y) increase in passenger traffic and a 31% y-o-y growth in average base fare in 1QFY16. Yields, as measured by revenue per available seat kilometre, surged 17% y-o-y, outpacing a 7% y-o-y rise in capacity. Its passenger load factor was also up eight percentage points to 82%, as passenger demand exceeded capacity addition in 1QFY16. “In 1QFY16, the China market contributed the highest growth to Malaysia AAX operations. Revenue from China increased 49% y-o-y due to higher passenger traffic, while average base fare improved 54% y-o-y,” said AAX group chief executive officer (CEO) Datuk Kamarudin Meranun in the statement. He said the positive trend should carry through to 2016 with the implementation of the visa waiver for Chinese tourists visiting Malaysia, adding AAX plans to fortify its presence in China with more new routes from Malaysia and Thailand this year. AAX ops in South Korea and Japan have also improved. 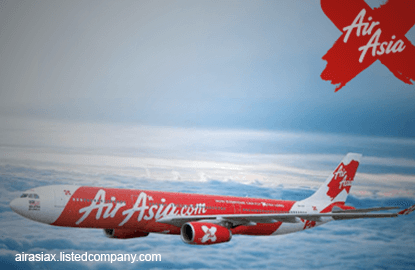 It is also strengthening its presence in Australia by resuming capacity growth to high-demand routes from Kuala Lumpur, while introducing new FlyThru pairings to connect Australia with Asia and the Middle East, Kamarudin added. “With these expansions, we are expecting 2016’s FlyThru traffic to grow 19% y-o-y and our market share to increase from 3% to 15% of total passengers travelled in our existing markets. The enhanced city pairings for China-Australia, India-Australia and Australia-Tehran will be the key growth drivers in 2016,” he said. AAX is also expected to take delivery of two more aircraft in the second half of 2016; it currently has 29 aircraft. In 1QFY16, the airline’s fuel expenses reduced by 11% on lower fuel prices, which helped trim its cost per available seat kilometre by 8% y-o-y. AAX CEO Benyamin Ismail said AAX has fully hedged its fuel requirement for the remaining quarters in 2016 at an average jet fuel price of US$54 (RM222.48) per barrel on planned existing routes. “This will allow us to mitigate fuel cost volatility and better manage cost while we venture into new routes,” he said.